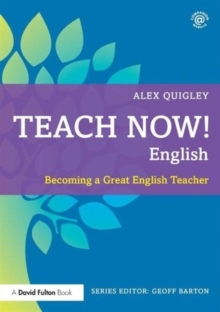 Written by a highly-skilled practitioner, this practical, classroom-focused guide contains all the support you need to become a great English teacher. Combining a grounded, modern rationale for learning and teaching with highly practical training approaches, the book guides you through all the different aspects of English teaching offering clear, straightforward advice on classroom practice, lesson planning and working in schools. Celebrating the values of English teaching, Alex Quigley sets out a `steps to success' model that will help you to go from novice to expert teacher. The English curriculum, planning, assessment, behaviour management, literacy and differentiation are all discussed in detail alongside carefully chosen examples to demonstrate good practice. Throughout the book, there is a great selection of ready-to-use activities and techniques, including effective reading and writing strategies, pedagogies for teaching poetry and Shakespeare, and how to harness the power of debate, dialogue and drama, all of which will help you overcome any challenges and put you on the fast track to success in the classroom. Covering everything you need to know, this book is your essential guide as you start your exciting and rewarding career as an outstanding English teacher.